At Coffee News® Southeast, our mission is to strengthen our community by promoting small and medium-sized businesses, and to provide awareness to local non- and not-for-profit organizations. By targeting the consumers “most likely” to use their product or service, Coffee News® empowers businesses to affordably implement consistent and repetitive advertising that yields results. Coffee News® manages to reach the highest and most potent concentration of potential customers of ANY media – for a fraction of the cost! Coffee News® is a weekly, one page publication, distributed free of charge to local restaurants, coffee shops, cafeterias, hospitals, medical offices, car service centers and anywhere else people may be out spending discretionary income. Truth is, no matter what the economy is doing; the first thing most people cut from their budget is eating out; and since our publication is found primarily in restaurants; we help business owners reach the right demographic – those with money to spend on their goods and services. Coffee News® is an entertaining, upbeat publication that provides patrons with a pleasant diversion while they wait. 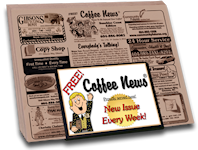 Coffee News® was designed as an alternative to expensive traditional print advertising because it provides local businesses with an inexpensive, highly effective and highly visible outlet for their ads. Everything in Coffee News® is fun, entertaining and positive – no bad news here! Filled with unusual news stories, jokes, trivia and amazing facts, it is a big breath of FRESH AIR to millions of readers who are tired of hearing only the bad news. Coffee News® also highlights What’s Happening in your community each week. Take a few moments to explore our site and read more about Coffee News® and its unique benefits to advertisers, restaurants and your local community. To Advertise Call: 423-458-2673 Email us your inquiries here!